From British aces Douglas Bader and Johnnie Johnson, to the great South African Sailor Malan and American Art Donahue, Kenley had always been host to some of the greatest WWII pilots from all over the world. Perhaps none more so — and what is often overlooked in history — than the many skilled Indian Sikh pilots who served here, particularly, fighter pilot Mahinder Singh Pujji. Pujji first arrived in the UK in August 1940 after responding to an RAF recruitment advert he saw in India. He was given the King’s commission in October that year and within weeks was sent to RAF Depot Uxbridge to begin his training. Pujji was then sent to No.9 Advanced Unit at RAF Hullavington, where he became part of the first batch of Indian pilots who were to receive their Volunteer Reserve Commission. Of the 24 Indian Pilots selected, 18 passed; six of them became fighter pilots, including Pujji, and the rest became bomber pilots. Once he had received his RAF Wings on 16 April 1941, Pujji, along with a few others from the 24 Indian pilots, were assigned to No. 56 Operational Training Unit at RAF Sutton Bridge. It was here that they first began advanced pilot training in the legendary Hawker Hurricane — which Pujji was to fly in and out of Kenley and prefer to the Spitfire. Before Pujji arrived at Kenley, his first experiences of combat came with his posting with No. 43 Squadron at RAF Martlesham. It was also around this time that he first made the request to fly with his turban, creating what would become the late fighter pilot’s most indelible and iconic image. They designed a special cap to fit over the turban, enabling him to still use his headphones and oxygen mask whilst flying with it. The turban, which also proudly displayed his RAF wings, was to become even more special to him in ways that he could never have imagined. Not only was it a symbol of his faith and bravery, but it endeared him to all those around him in London, where he was often offered free groceries and asked to jump cinema queues — and it would even save his life. In Pujji’s biography, For King and Another Country, his arrival at Kenley is placed not long after his time with No.43 Squadron, when he transferred to No. 258 Squadron in summer 1941: “I was posted to No.258 Squadron, flying Hurricane IIB fighters from RAF Kenley, which is a couple of miles south of Croydon. We were a mixed bunch, with pilots also from Poland, America, Canada and Australia”. He continued to fly Hurricanes in and out of Kenley and Biggin Hill just like he had at Martlesham, switching from base to base every few weeks in the London area. He describes the Hurricane as being “equipped with twelve machine guns” that were “extensively flown day and night to intercept German bombers and reconnaissance aircraft”. Although despite his love for the Hurricane, Pujji later converted to the Spitfire Mk.V when he was promoted to Flight Commander. His operational tasks included fighter sweeps over occupied Europe where he made low-level attacks on German targets. It was during these operations that Pujji demonstrated his great ability as a pilot and dogfighter: “I was involved in many dogfights with Luftwaffe fighters. My total tally was two Messerschmitt Me 109s confirmed as shot down and three damaged”. However, no great pilot is without their tales of close shaves and great escapes. Pujji was forced down twice during the war. The first came when he was shot by a Messerschmitt over the English Channel, forcing him to glide his plane just far enough to be able to make a crash landing. He recalls the incident in his biography: “a hail of bullets smashed my dashboard to smithereens and sent engine oil arcing across the cockpit, completely obscuring my vision”. Pujji contemplated bailing out into the sea (even though he could not swim), but when he caught a glimpse of the emerging White Cliffs of Dover he decided to steer the plane to land: “I only knew I was 200 feet up. But by God’s work, I crash landed”. Pujji recounts that after he had crashed he put his hands to his turban and found “it was full of blood”. It would turn out that the turban actually helped cushion the blow to his head from the crash, making Pujji believe his survival to be yet another example of ‘God’s work’. Pujji was pulled out of the burning aircraft with serious injuries. But within a couple of weeks, he was back fighting in the sky over Kenley and defending his country. After the Battle of Britain, Pujji was sent to the RAF in North Africa. He was then transferred to the Indian Air Force, where he became Squadron Leader in 1945, earning him the cachet of being one of the few Indian pilots to have served in all three theatres of war. At the end of the war, Mahinder Singh Pujji was awarded the Distinguished Flying Cross for outstanding bravery and service to Britain. He was later discharged from the Royal Indian Air Force following a long illness and became an Aerodrome officer at Safdarjung Aerodrome Delhi. However, his love and fondness for England never ceased, and he returned to settle in Gravesend, Kent. Before his death in 2010, Pujji campaigned to raise awareness of the Sikh contribution to the British war effort. He believed that films and media had literally whitewashed history to ignore the diverse nature of the British Armed Forces. He said that he feels “no one in authority remembers that we [Sikhs] are here and we were part of World War II”. In January 2009, due to his campaigning, the Royal Air Force Museum Cosford opened the Diversity In The Royal Air Force exhibition, of which Pujji was the guest of honour. 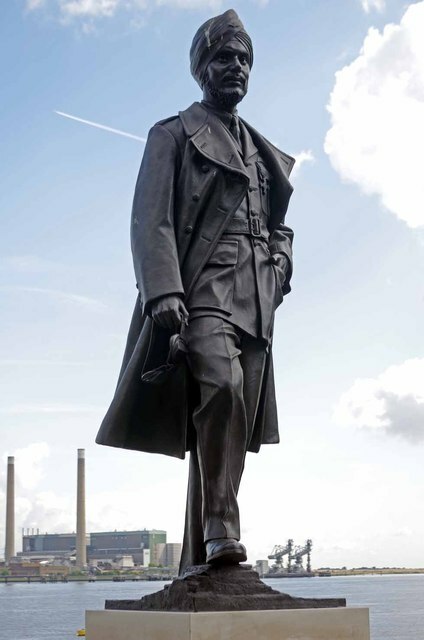 His statue was also unveiled at St Andrew’s Gardens, on 28 November 2014. Out of the original 24 volunteer Indian fighter pilots, Pujji was only one of two who survived. We must all ensure that the sacrifice and commitment of those Indian servicemen who served our country are never forgotten. Shrabani Basu (2015): For King and Another Country: Indian Soldiers on the Western Front 1914 -18. Bloomsbury India, 442p. You’re absolutely right, thanks a lot!